This post follows on from the previous post on Gibbs sampling in various languages. In that post a simple Gibbs sampler was implemented in various languages, and speeds were compared. It was seen that R is very slow for iterative simulation algorithms characteristic of MCMC methods such as the Gibbs sampler. Statically typed languages such as C/C++ and Java were seen to be fastest for this type of algorithm. Since many statisticians like to use R for most of their work, there is natural interest in the possibility of extending R by calling simulation algorithms written in other languages. It turns out to be straightforward to call C, C++ and Java from within R, so this post will look at how this can be done, and exactly how fast the different options turn out to be. The post draws heavily on my previous posts on calling C from R and calling Java from R, as well as Dirk Eddelbuettel’s post on calling C++ from R, and it may be helpful to consult these posts for further details. This code works perfectly, but is very slow. It takes 458.9 seconds on my very fast laptop (details given in previous post). The new function gibbsC works just like gibbs, but takes just 12.1 seconds to run. This is roughly 40 times faster than the pure R version, which is a big deal. This runs at the same speed as the code compiled separately, and is arguably a bit cleaner in this case. Personally I’m not a big fan of inlining code unless it is something really very simple. If there is one thing that we have learned from the murky world of web development, it is that little good comes from mixing up different languages in the same source code file! We can also inline C++ code into R using the inline and Rcpp packages. The code below originates from Sanjog Misra, and was discussed in the post by Dirk Eddelbuettel mentioned at the start of this post. This version of the sampler runs in 12.4 seconds, just a little bit slower than the C version. It can be compiled with R CMD SHLIB -lgsl -lgslcblas gibbsGSL.c, and then called as for the regular C version. This runs in 8.0 seconds, which is noticeably faster than the Java code, but probably not “enough” faster to make it an important factor to consider in language choice. In this post I’ve shown that it is relatively straightforward to call code written in C, C++ or Java from within R, and that this can give very significant performance gains relative to pure R code. All of the options give fairly similar performance gains. I showed that in the case of this particular example, the “obvious” Java code is actually slightly faster than the “obvious” C or C++ code, and explained why, and how to make the C version slightly faster by using the GSL. The post by Dirk shows how to call the GSL generators from the C++ version, which I haven’t replicated here. I’ve recently acquired a new laptop with an Intel i7 Quad Core CPU – an i7-940XM to be precise, and I’m interested in the possibility of running parallel MCMC codes on this machine (a Dell Precision M4500) in order to speed things up a bit. I’m running the AMD64 version of Ubuntu Linux 10.10 on it, as it has 8GB of (1333MHz DDR2 dual channel) RAM. It also contains an NVIDIA 1GB Quadro FX graphics card, which I could probably also use for GPU-style speed-up using CUDA, but I don’t really want that kind of hassle if I can avoid it. In a previous post I gave an Introduction to parallel MCMC, which explains how to set up an MPI-based parallel computing environment with Ubuntu. In this post I’m just going to look at a very simple embarrassingly parallel Monte Carlo code, based on the code monte-carlo.c from the previous post. The slightly modified version of the code is given below. How many processes should one run on this machine? This is an interesting question. There is only one CPU in this laptop, but as the name suggests, it has 4 cores. Furthermore, each of those cores is hyper-threaded, so the linux kernel presents it to the user as 8 processors (4 cores, 8 siblings), as a quick cat /proc/cpuinfo will confirm. Does this really mean that it is the equivalent of 8 independent CPUs? The short answer is “no”, but running 8 processes of an MPI (or OpenMP) job could still be optimal. 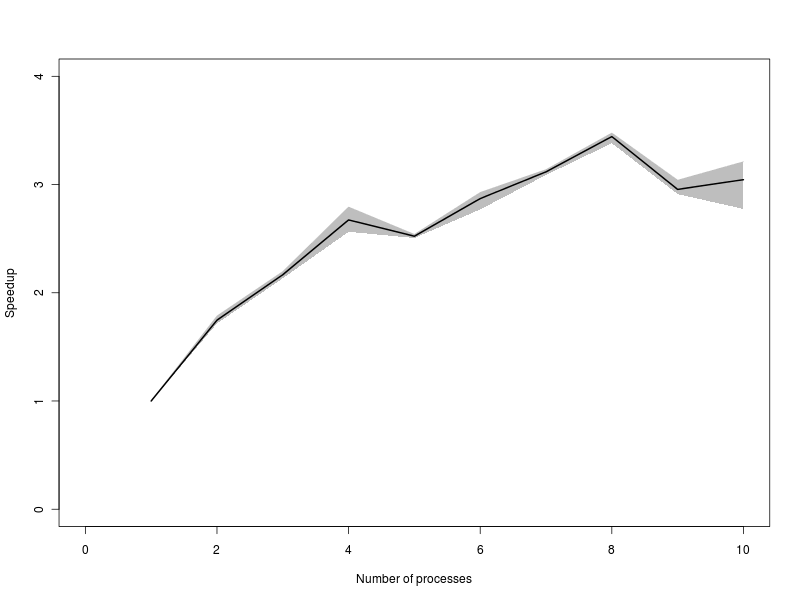 I investigated this issue empirically by varying the number of processes for the MPI job from 1 to 10, doing 3 repeats for each to get some kind of idea of variability (I’ve been working in a lab recently, so I know that all good biologists always do 3 repeats of everything!). The conditions were by no means optimal, but probably quite typical – I was running the Ubuntu window manager, several terminal windows, had Firefox open with several tabs in another workspace, and Xemacs open with several buffers, etc. The raw timings (in seconds) are given below. 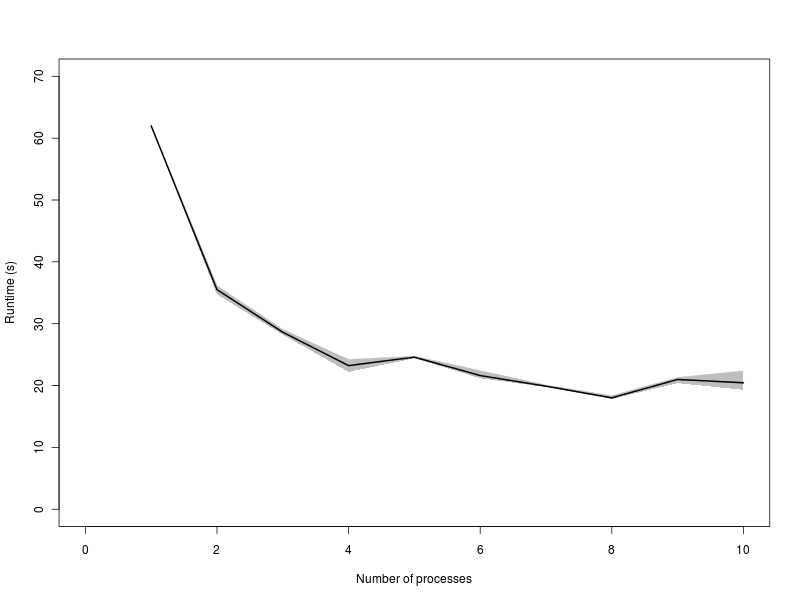 A quick scan of the numbers in the table makes sense – the time taken decreases steadily as the number of processes increases up to 8 processes, and then increases again as the number goes above 8. This is exactly the kind of qualitative pattern one would hope to see, but the quantitative pattern is a bit more interesting. First let’s look at a plot of the timings. You will probably need to click on the image to be able to read the axes. The black line gives the average time, and the grey envelope covers all 3 timings. Again, this is broadly what I would have expected – time decreasing steadily to 4 processes, then diminishing returns from 4 to 8 processes, and a penalty for attempting to run more than 8 processes in parallel. Now lets look at the speed up (speed relative to the average time of the 1 processor version). This post is aimed at people who already know how to code up Markov Chain Monte Carlo (MCMC) algorithms in C, but are interested in how to parallelise their code to run on multi-core machines and HPC clusters. I discussed different languages for coding MCMC algorithms in a previous post. The advantage of C is that it is fast, standard and has excellent scientific library support. Ultimately, people pursuing this route will be interested in running their code on large clusters of fast servers, but for the purposes of development and testing, this really isn’t necessary. A single dual-core laptop, or similar, is absolutely fine. I develop and test on a dual-core laptop running Ubuntu linux, so that is what I will assume for the rest of this post. There are several possible environments for parallel computing, but I will focus on the Message-Passing Interface (MPI). This is a well-established standard for parallel computing, there are many implementations, and it is by far the most commonly used high performance computing (HPC) framework today. Even if you are ultimately interested in writing code for novel architectures such as GPUs, learning the basics of parallel computation using MPI will be time well spent. A simple script to generate some non-uniform random numbers is given below. When writing parallel Monte Carlo codes, it is important to be able to use independent streams of random numbers on each processor. Although it is tempting to “fudge” things by using a random number generator with a different seed on each processor, this does not guarantee independence of the streams, and an unfortunate choice of seeds could potentially lead to bad behaviour of your algorithm. The solution to this problem is to use a parallel random number generator (PRNG), designed specifically to give independent streams on different processors. Unfortunately the GSL does not have native support for such parallel random number generators, so an external library should be used. SPRNG 2.0 is a popular choice. SPRNG is designed so that it can be used with MPI, but also that it does not have to be. This is an issue, as the standard binary packages distributed with Ubuntu (libsprng2, libsprng2-dev) are compiled without MPI support. If you are going to be using SPRNG with MPI, things are simpler with MPI support, so it makes sense to download sprng2.0b.tar.gz from the SPRNG web site, and build it from source, carefully following the instructions for including MPI support. If you are not familiar with building libraries from source, you may need help from someone who is. If it doesn’t build, there are many possible reasons. Check the error messages carefully. However, if the compilation fails at the linking stage with obscure messages about not being able to find certain SPRNG MPI functions, one possibility is that the SPRNG library has not been compiled with MPI support. A new GSL RNG, gsl_rng_sprng20 is created, by including gsl-sprng.h immediately after gsl_rng.h. If you want to set a seed, do so in the usual GSL way, but make sure to set it to be the same on each processor. I have had several emails recently from people who claim that gsl-sprng.h “doesn’t work”. All I can say is that it still works for me! I suspect the problem is that people are attempting to use it with a version of SPRNG without MPI support. That won’t work… Check that the previous SPRNG example works, first. Once parallel Monte Carlo has been mastered, it is time to move on to parallel MCMC. First it makes sense to understand how to run parallel MCMC chains in an MPI environment. I will illustrate this with a simple Metropolis-Hastings algorithm to sample a standard normal using uniform proposals, as discussed in a previous post. Here an independent chain is run on each processor, and the results are written into separate files. The book was eventually published in 2005 after a long delay. The publisher which originally commisioned the handbook (Marcel Dekker) was taken over by CRC Press before publication, and the project lay dormant for a couple of years until the new publisher picked it up again and decided to proceed with publication. I have a draft of my original submission in PDF which I recommend reading for further information. The code examples used are also available for download, including several of the examples used in this post, as well as an extended case study on parallelisation of a single chain for Bayesian inference in a stochastic volatility model. Although the chapter is nearly 10 years old, the issues discussed are all still remarkably up-to-date, and the code examples all still work. I think that is a testament to the stability of the technology adopted (C, MPI, GSL). Some of the other handbook chapters have not stood the test of time so well. For basic information on getting started with MPI and key MPI commands for implementing parallel MCMC algorithms, the above mentioned book chapter is a reasonable place to start. Read it all through carefully, run the examples, and carefully study the code for the parallel stochastic volatility example. Once that is understood, you should find it possible to start writing your own parallel MCMC algorithms. For further information about more sophisticated MPI usage and additional commands, I find the annotated specification: MPI – The complete reference to be as good a source as any.